Marie Winn's fascination with the birds of New York is are told in her books "Red-Tails in Love" and "Central Park in the Dark: More Mysteries of Urban Wildlife." Winn and others track and observe screech owls, orioles, and moths among other wildlife in Central Park, at night. If I lived in New York I would be a participant in these moon- and ambient-light lit adventures! Birding also happens in Prospect Park (Brooklyn), Pelham Bay Park (Bronx), and Forest Park and Alley Pond Park (Queens). New York Times reporters Anne Raver (she writes engrossing essays column in the Home & Garden section) and Katherine Zoepf offer some online for birders: the blog, Urban Hawks; nycadubon.prg; prospectpark.org/calendar/audubon_center_events; and Sibley and Peterson field guides.Closer to home, the East Bay Regional Park District offers "Tuesdays for the Birds" bird walks in its regional parks. The next walk is scheduled for July 22, 7 to 9:30 a.m. in Carquinez Strait Regional Shoreline. Bethany Facendini will lead the walk; call 510-525-2233 for the meeting place. The park district hosts additional birding programs: Thursday Birding; Wonderful World of Water Birds; Bike 'n Bird; Biking, Botanizing, and Birding the Bay; and Family Birdwalk!. 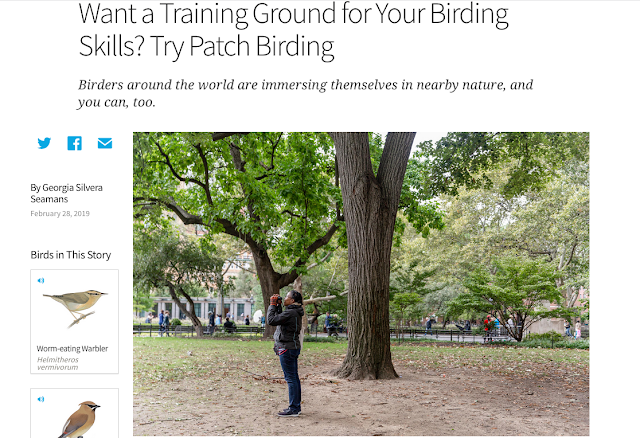 In her article, Times reporter, Katherine Zoepf, mentioned a birder's life list. A life list is "a list of all the bird species [a birder has] identified with absolute certainty during [her or his] whole lifetime of serious birding." As a novice birder my life list is short but it does have a "good bird" on it: a yellow-billed kite seen from a canoe in the Okavango Delta, Botswana. I fell out of the canoe while peering at the kite.